I like what if scenarios. Like, what if we instituted needs-based funding exclusively in the state for education? Or what if we implemented a rolling property reassessment statewide as properties are sold or transferred? Or what if we consolidated some of the public school districts in Delaware? Wait a second. Exceptional Delaware posted about an analysis directed by the General Assembly and done by the Secretary of Education on the feasibility of merging all Kent districts together and all Sussex districts together. I’ll save you having to read the DDOE report and give you the TL;DR (too long; didn’t read): At the time of the report, it was projected that merging the districts would create additional costs for the state and counties, not reduce them. For what it’s worth the report also said that Delaware’s education funding model was “sound” and only needed “marginal adjustments” mostly in the equalization category. The report was from 2001 and- hey, who put that salt-lick sized grain of salt here? 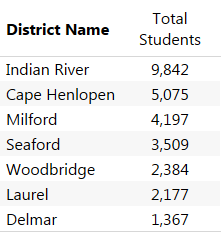 Currently there are 7 public school districts serving the county’s ~28,500 district students, Milford, Cape Henlopen, Indian River, Delmar, Laurel, Seaford and Woodbridge. (And you thought New Castle county’s 5 districts were silly). You might see where I’m going with this already. I’m not sure of the reasoning behind creating entire districts that serve less than 3,000 students each. But, what if we consolidated not all but *some* of the Sussex districts in an effort to create as few equitably populated districts as possible? Indian River is the largest district in student population, so maybe let’s use it as our template. If we merged Milford and Cape Henlopen in to an East Sussex County School District, it would serve 9,272 students. If we merged Woodbridge, Seaford, Laurel and Delmar school districts into a West Sussex County School District it would serve 9,437 students. Now instead of 7 districts, there are 3 and all would serve between 9,000-10,000 students. Equitable size in terms of number of students. But we all know just adding total number of students together doesn’t really give any useful information. Maybe if we look at the demographic makeup of the new districts after merging them we’d glean something more useful. So let’s do that using 2014-15 school year data. Indian River still takes the lead in student population, ELL, and Special Ed students and the two new consolidated districts are not all that different from one another in terms of demographic makeup. We know managing school districts that size is feasible (see: the rest of Delaware) so, where can we go from here? If the Archdiocese of Philadelphia can handle all the schools, parishes and students. Then why can’t Delaware, out of one office? Delaware let all these “Charter” schools in, THAT was the biggest mistake! Now the pie is divided even thinner. Their glorified private schools, taking public money. 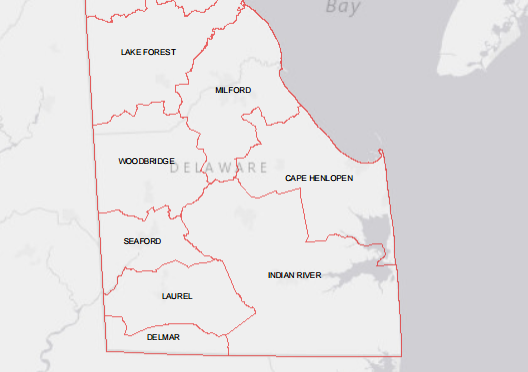 Look at Appo & Cape Henlopen, they look like small junior colleges.